How Far Along? 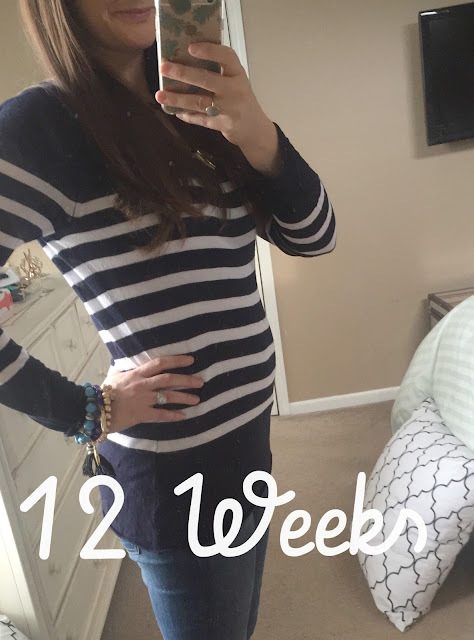 14 weeks, 2 days! Already in the second trimester! Weight Gain: I think right around 2 lbs! Stretch marks: None so far. Using my two favorite products to combat these - Mustela's Stretch and Hydration Assistant. I'm obsessed with these creams - the best! Symptoms: Unlike with Camden, this pregnancy I've had morning sickness (more like all day...worst in evening type of sickness) up until about 10.5 weeks! I only actually threw up a couple of times, but just that all day queasy kinda feeling! I was gagging all the time throughout the day. It stopped when I was around 10.5 weeks pregnant and my energy came back at that point too, so I've been feeling really great lately! Another symptom that I have to mention are c-c-c-crazzyy dreams practically every night. 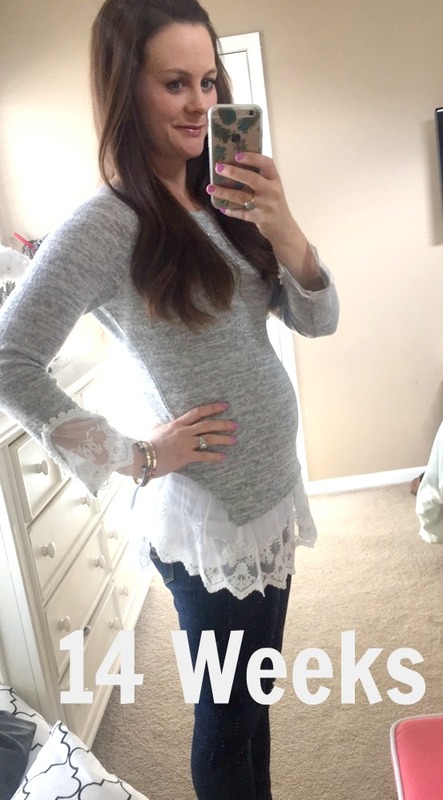 Cravings: It's fun to compare my pregnancies as they have been pretty different so far. With Camden I remember craving cold, healthy items like smoothies and fruit. This pregnancy? Sweets...carbs...sweets...more carbs! I've also been craving more salty items, too. I do think a lot of it has to do with the season though - my first trimester with Camden was in the summer, and now it has been during the holidays when there are cookies and sweets everywhere! Gender: We find out next week! Not much longer!! Billy thinks it is a girl and I, not surprisingly, go back and forth almost everyday. What are you, baby K?! Nursery: Honestly? Haven't thought much about it yet. Once we find out if Baby K is a boy or girl, I'm sure we will start brainstorming things! Movement: Not yet, but so excited for that. It's the best part! Sleep: Not lacking in that department, that's for sure. Naps still happen from time to time (a perk of only working part time...on my days home with Cam when he naps I definitely sometimes do as well!) and haven't had any issues sleeping at night yet. Will bust out my beloved Bump Nest pillow when I start to get a little more uncomfortable. Workouts: Getting in about 3 per week right now! Best Moment This Week: Hearing little babe's heartbeat the other day and continuing to feel well. Looking Forward To: Finding out if Camden will have a brother or sister - what's your guess?! And here's a bump pic from 12 Weeks! Yay! Congrats on week 14 (: where is your shirt from in the first picture? The gray and white lace one? It's adorable!! I would size up as it runs small! Super cute! Yes, where is your shirt from in the first pic? thank you :) sweater is from here: http://bit.ly/1nN0Fp5. and it runs small so size up! awww thank you Allison!! that is so nice! You look great! Glad you are back to feeling good too! Yay, congratulations. It's the best that second pregnancy when you are a bit more relaxed and can really enjoy all the little things. It'll be so fun to find out if Camden will get a brother or a sister! You are seriously the cutest pregnant person ever!! I'm thinking (ok secretly hoping) it's a girl!! You're looking great!!! Oh and that lace top is adorable on you! Yay, so exciting you find out so soon, can't wait to hear! Look at that cute lil bump! Eeeep! So excited for you my friend!